A fish far from home? The JLB Smith Institute was privileged to host visiting scientist Dr Keiichi Matsuura from the National Science Museum in Tokyo for the month of November. Keiichi is a world authority on pufferfishes (Family Tetraodontidae) and trigger-fishes (Family Balistidae). He is writing these family accounts for the forthcoming book, Fishes of the Western Indian Ocean (edited by Phil Heemstra and Jack Randall), hence his visit to the Institute to study these families. Keiichi was looking through our fish and slide collections to choose which specimens and photos he wanted Elaine Heemstra to use for paintings, and at the same time checking our identifications. One of the tasks I am busy with, is computerising our marine slide collection, and was thus changing the names of the fishes on some of the slides according to Keiichi. As I also help with fish identification, I was intrigued to see that he had changed the identification of one of our triggerfish, collected on a Fish-Watch dive at Aliwal in 1998. It was named Sufflamen bursa and he changed it to Sufflamen albicaudatum. Wanting to see what the difference was, so that I could pick it up next time, I turned to Smiths’ Sea Fishes, only to read that Sufflamen albicaudatum was endemic to the Red Sea! Fortunately Keiichi was working next door and I showed him the slide and he confirmed that it was indeed albicaudatum. When I told him that it was caught at Aliwal Shoal, where he had dived the previous week with the latest Fish-Watch expedition, his eyebrows nearly hit the roof. He quickly muttered that he must change his manuscript and rushed to his laptop. Previously, Sufflamen albicaudatum had only been found in the Red Sea! This kind of discovery is what makes studying any biological science so rewarding; the boundaries are forever changing and anyone (not only the scientists) can make a valuable contribution to our knowledge of fishes. 60 mm,from Aliwal Shoal; a new record for southern Africa. 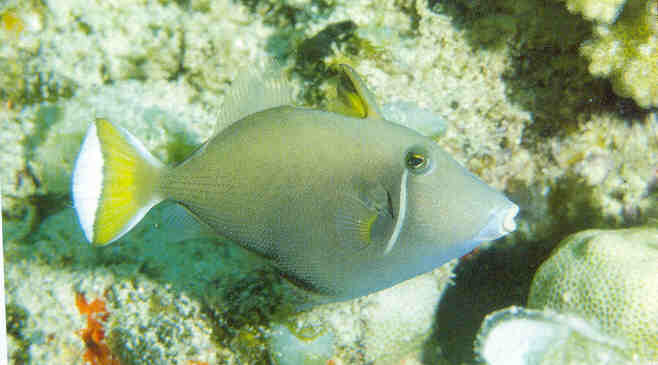 We are keen for all you divers and underwater photographers to look out for the white-tail trigger-fish. The photos above illustrate the differences between Sufflamen bursa, and S. albicaudatum; note that albicaudatum has a white margin completely encircling the caudal fin. 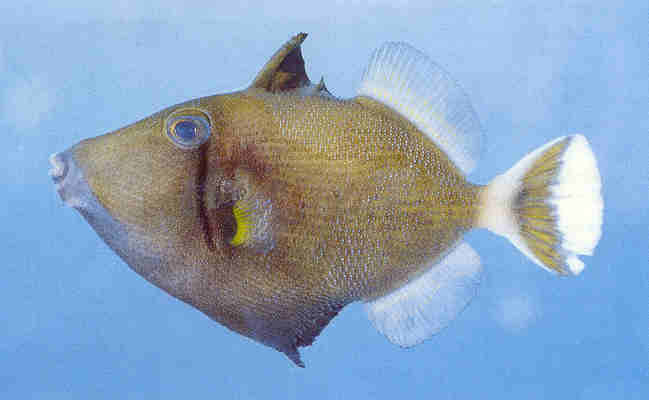 The halfmoon triggerfish, S. chrysopterum is more similar to the white-tail triggerfish, as the caudal fin has a large, yellow-green or brown crescent with a white margin on the upper, lower and rear margins of the fin. And, like S. albicaudatum, it also has a vertical line (white, yellow or black) from rear edge of eye to below the pectoral-fin base. Adult chrysopterum are common at Aliwal Shoal, and juveniles have been found as far south as St Francis Bay. Sufflamen chrysopterum, adult, Mauritius; J.E. Randall, photo. 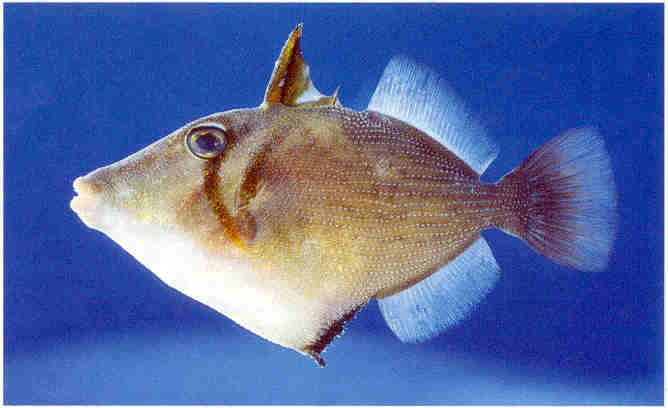 Editor’s note: In Smiths Sea Fishes, these triggerfish names are spelt incorrectly as Sufflamen alibicaudatus and S. chrysopterus. The -us (masculine) ending should be changed to the -um (neuter) ending to agree with the gender of Sufflamen. Likewise the name fraenatus (meaning “bridled”) should be Sufflamen fraenatum. The name Sufflamen bursa stays unchanged, as bursa means “leather” and is thus a noun in apposition to the genus name. N.B. Please note that with all the images in this and the following articles, a larger image can be seen by right clicking on the image and then clicking on view image.